^ Augusta area tied to celebrities. Chronicle.augusta.com. [2016-07-31]. ^ Lipton, James (host). Danny Glover. Inside the Actors Studio. 第4季. 第8集. 1998-10-11. Bravo. 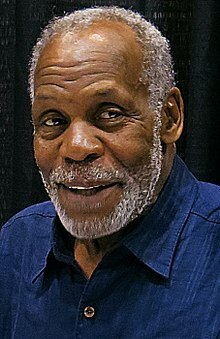 ^ Actor and activist Danny Glover to be honored by San Francisco State University. San Francisco State University. 1999-04-26 [2015-01-24]. ^ Lewis, Princine. Actor, director, producer, political activist Danny Glover headlines 2014 MLK celebration at Vanderbilt. Vanderbilt University. 2013-11-15 [2015-01-24]. ^ 'Sharing Miracles' Television Program to Feature Award-Winning Hollywood Star Danny Glover. News on 6. PR Newswire. 2009-09-02 [2015-01-24]. （原始内容存档于2015年2月13日）. ^ Frank Whaley, Danny Glover Joining Lucas Till in 'Monster Trucks' (Exclusive). hollywoodreporter.com. 2014-01-04 [2014-04-29]. ^ Archived copy. [2012-04-21]. （原始内容存档于2016-03-16）.